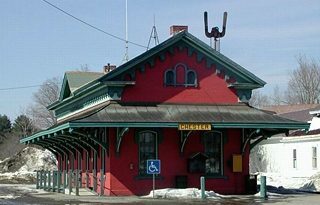 *Area, Population and Density rankings refer to Townshend’s relative position among Vermont’s 255 civic entities (9 cities, 242 towns, 4 gores and grants). Complete rankings are here. In Benning Wentworth’s time the many branches of the Townshend family made up one of the most influential groups in British politics. Over a twenty-year period there were no less than five Townshends in Parliament, and numerous others were scattered throughout the government. Various titles were held in different branches, and they were related to half of England’s noble families. If we had to identify an individual as being on Wentworth’s mind as he named this town it would probably be Charles Townshend II, a barrister and a member of the Board of Trade and Plantations. It is the latter role which would have concerned Wentworth the most. One of the most cherished pieces of local folklore is how the village of Harmonyville was named. In the 1830’s people in Townshend village were apparently jealous of how busy a place the hamlet was, and dubbed it “Tin Pot”. Not to be outdone, residents of the hamlet started calling Townshend village “Fly Pot”. In an effort to put a stop to the Tin Pot name, a resident painted two bright signs proclaiming it as “Harmonyville” and nailed them above the entrances to the covered bridge. The name stuck: it can be found on most Vermont maps. Scott Bridge is here, the longest covered bridge in Vermont. 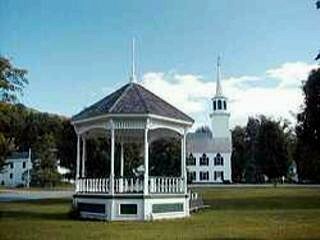 A noble village green (the hallmark of a fine Vermont village) and the most photographed church in the US (though Lunenburg makes the same claim). As authentic as it may appear, the gazebo pictured above was constructed for Chevy Chase’s 1988 movie Funny Farm; townsfolk liked it enough to keep it once filming ended. If you’re into genealogy, bring plenty of notetaking materials: there are more than 15 cemeteries scattered about. 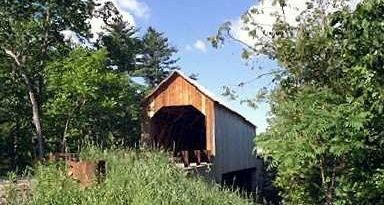 Click Here for a map of all bridges in Windham County.